At least one new member of the House of Representatives knows the difference between fiber and broadband, between multiplexing and the local multiplex. 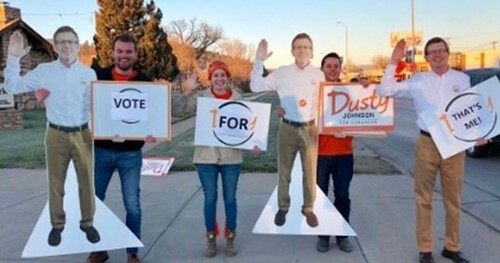 That's because South Dakota residents just elected Vantage Point Solutions' Vice President of Consulting Dusty Johnson as the state's lone Representative to the US House. Johnson, who has held the VP position since 2014, will leave his commercial role in December before heading to DC to take office in January 2019. While at Vantage Point, Johnson helped the consulting department's clients secure more than $165 million in the Connect America 903 (CAF II Auction) for rural broadband. It also helped other broadband provider clients with strategic, financial and operational expertise. "Dusty has been a one-of-a-kind colleague and leader, and we are glad to have had him on the team for these last four years," says Larry Thompson, CEO. "Vantage Point was very fortunate that Dusty took time away from public service to lead our Consulting group, and we look forward to having -- as he’d often say during his campaign -- another broadband advocate in D.C."
Doug Johnson is trading in rural South Dakota for Washington, DC, after winning this year's mid-term election. Vantage Point will add a new consulting leader to the team to replace Johnson, the group said. With the departure of Johnson, the consulting team consists of Doug Eidahl, vice president of legal and regulatory; Kristy Szabo, director of consulting; and Jolyn Doering, manager of cost issues. "It has been an honor to serve the interests of rural broadband providers, and a privilege to do so alongside such a talented, hardworking and fun group of colleagues," said Johnson. "The last few years at Vantage Point have been not just rewarding, but educational and I look forward to taking the lessons learned from our staff and clients to create meaningful change in Washington."